We went to the Pink Hotel first, and by mistake as I thought the flagship store would be the one with the large pink room filled with Sketch-style chairs. 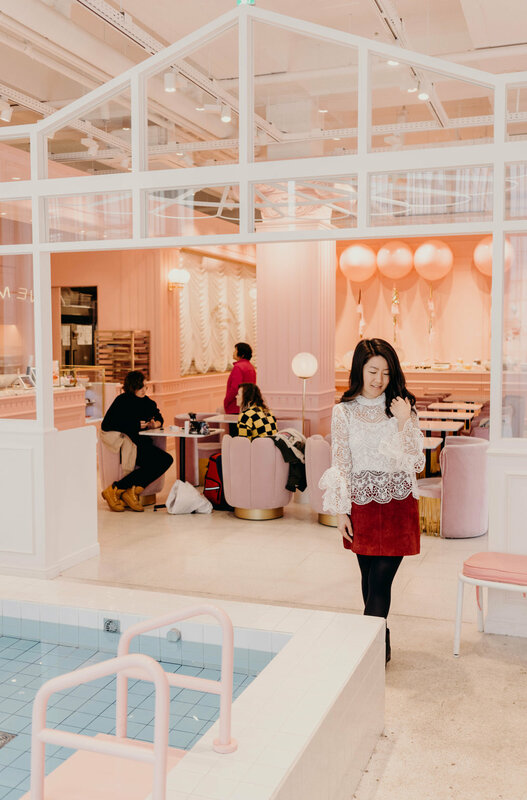 Instead, it was a multi-story display of the brand’s beauty and clothing lines with a pool-inspired cafe on the top floor and up to the rooftop. It was worth seeing once, and would be more so as a tourist or for shopping, at least for the Myeong-dong street food we snacked on afterward on our way back to the station. So, we tried the Pink Pool Cafe in Hongdae another day, which you sort of have to search for—again, it’s on the top floor, but the entry is tucked away in a corner and not obviously marked. It was, once we found it, unapologetically pink, and, as its name would suggest, there was a pool. The waiters were much nicer than either the Pink Hotel’s or the Pink Pool Cafe’s sales associates, and the mojito mocktail was quite good (it’s surprising how difficult it is, actually, to make a good faux-jito). But honestly, and I love pink, I thought both cafes were overrated, and even a little dirty. I prefer hidden gems to hotspots, though, so to each her own.